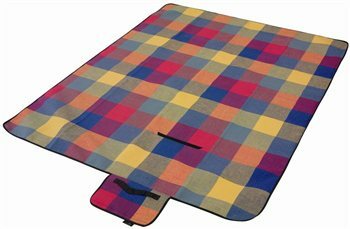 Easy Camp Picnic/ Travel Rug is ideal for camping, picnics, caravanning, backpacking or protecting the car seats from muddy children or wet dogs. It can be stored at home or in the car easily thanks to its small pack size, making it ideal for those spontaneous days out. The Easy Camp Picnic Blanket has its own built in carry handle making it extremely easy to carry to the beach ,park or outdoor event and when no longer needed it rolls into its own carry case for storage. The Easy Camp Picnic Blanket has a water resistant PVC to protect you against dampness and clothing damage, and will keep you warm and dry when you are enjoying the great outdoors. Fantastic value, great size, good quality item would recommend.